When author Gabby Craven travels to Speranza, Sicily, for inspiration, she expects the scenery, the diverse culture and mouth-watering food, to create the winning formula. It certainly wasn’t meant to be in the form of Dr Nic Ravisi. It’s hard to ignore a man as passionate and caring about his patients as he is. He sacrificed love for the sake of his people and is determined to remain focused and committed to his calling. She doesn’t stand a chance of winning his heart. With the help of a mysterious woman, Gabby uncovers a love story from the past that could change everything for her and the unsuspecting townsfolk of Speranza. If you are going to read anything, do not pass this one. You will love the characters, the conflict. Especially the conflict and built up tension between Gabby and Nic. You are cheering them on, for these two loveable characters, to move past their differences and just go ahead and be together. Secrets are revealed, a love affair uncovered and a long time mystery is solved. 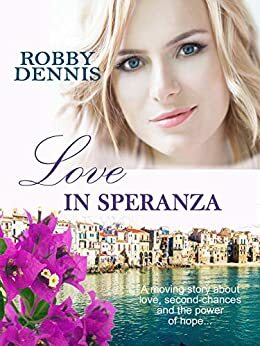 A brilliant read, I would recommend this book - Love in Speranza, by Robby Dennis. If you want a romance to read, this is the book for you - enjoy, I did. What an amazing first novel. I could not put it down. Well written with sympathetic characters. Can't wait to read Robby's next novel. The setting is lovely. A young Australian visiting the golden island of the Mediterranean that is Sicily meets a handsome local and grows to love the inhabitants of her new world as she falls in love. This is a well written and very pleasant foray into love, family history and second chances.